Amanda with her five year anniversary certificate! 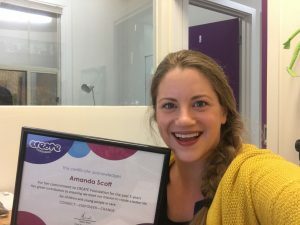 In May 2018, Community Facilitator Amanda celebrated her five year anniversary at CREATE Foundation! 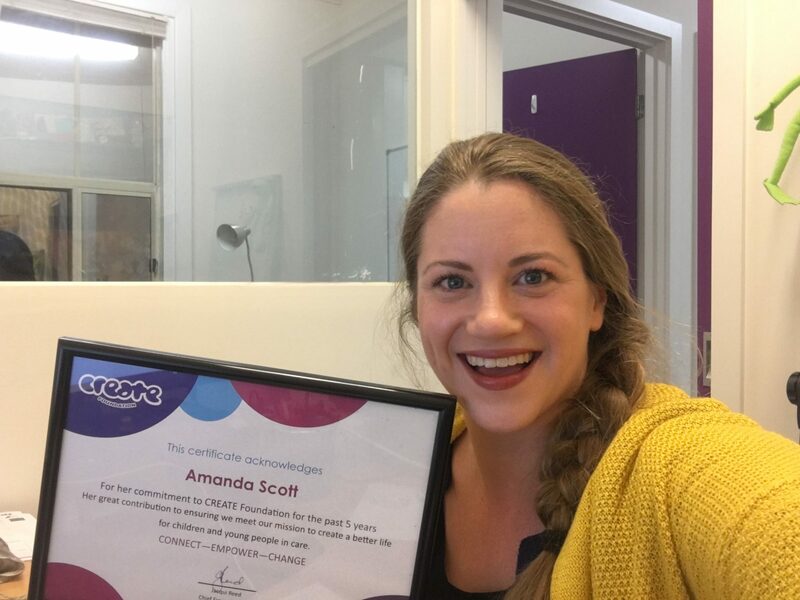 Over the past five years, Amanda has contributed to countless projects and made a huge difference to the lives of children and young people with a care experience. On behalf of CREATE and the children and young people we serve, we would like to extend a huge thank you to Amanda for all her dedication and hard work and most of all the warmth and positivity that she brings to the CREATE team. We are lucky to have your as part of the CREATE family. As part of the five year celebrations, Amanda has reflected on her CREATE journey and has shared some of her highlights over the past five years. How did it all start for you at CREATE? I started at CREATE in 2010 (when I was still a young person myself!) after working as a youth facilitator at the Reach Foundation. I’ve always been really passionate about creativity and creating spaces for young people to be themselves and be supported. CREATE seemed like an awesome organisation to keep creating those spaces and creating a supportive community for young people. It was also really great to have so many opportunities to be creative in the projects, events and programs I organised and delivered. I also love including young people in the planning and facilitation. When I am not at CREATE I am also a Creative Arts Therapist so I really appreciate how much CREATE is encouraging of creative ways to engage with children and young people. What has been your best memory? 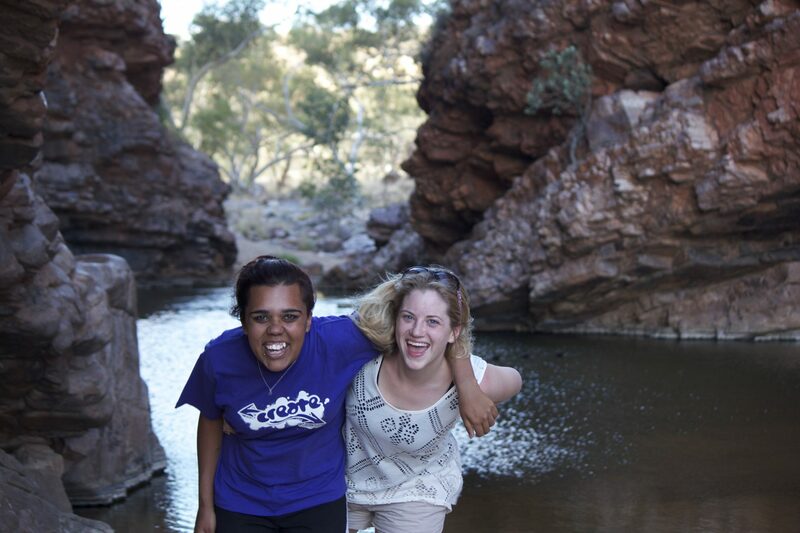 My favourite memory of CREATE was in 2013 when I got the opportunity to go to Alice Springs with Sharney, one of Victoria’s Young Consultants. We helped to develop an indigenous participation DVD and ran programs for some indigenous children and young people in care there along with the CREATE staff in Alice Springs. I really enjoyed it and it was amazing to see some of the incredible sights in Alice Springs. From your perspective, what would you say are CREATE’s greatest achievements over the years? 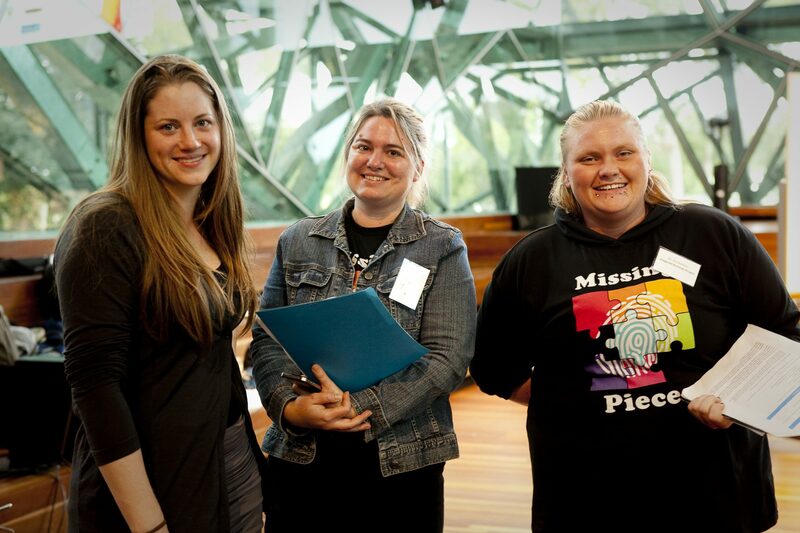 In Victoria, CREATE has become very well-known and respected in the sector. When I started, not that many people knew about CREATE so it’s amazing that we can now reach more children and young people than ever before. I also seen the creation of the National Conference which young people who have attended always rave about, and I have been lucky enough to attend twice! I have seen some positive changes in the leaving care space since and the LGBTIQ+ resource that was developed in Victoria for Carers and Workers to better supporting young people in care identifying as LGBTIQ+ has had such a great response also. There are so many achievements – I am really proud of the impact we have made through really listening to the voices of children and young people. What’s been the most challenging part of your role? I can remember many times on camps where we didn’t get any sleep, that was pretty challenging (sometimes young people don’t want to go to bed!!) but it made up for it when during the day I got to hang out with some awesome young people and hear about their lives and what they are passionate about, and how they wanted to make a difference to other children and young people in care. I feel very privileged to get to know them. What’s a great piece of advice you can give young people starting at clubCREATE? At CREATE there are so many different ways to be involved. You don’t need to jump in to everything straight away, and maybe to start with you may just want to come along to our connection events and have heaps of fun! When you’re ready to take on more of a leadership role or have your voice heard, we’ll be here ready and waiting, with heaps of other young people around to support and encourage you! Interested in joining the CREATE Crew? Check out our current vacancies page for available jobs around Australia.